A man was walking along a California beach and 1.) stumbled upon an old lamp partially 2.) burried in the 3.) sand. "This can´t be 4.) happening to me....a magic lamp"! He decided to 5.) pick it up and 6.) rub it. 7.) 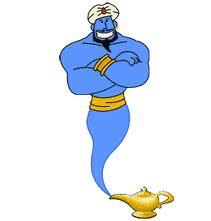 Suddenly a genie 8.) came out and the man was a little 9.) frightened. To the man´s surprise, the genie spoke in english and said. "Ok. Ok. You have 10.) released me from the lamp, blah, blah, blah." "This is the fourth time this month and I´m 11.) getting tired of 12.) giving wishes, so you can 13.) forget about having three wishes; you can only have one wish". but, I´m 15.) scared of flying and I get very 16.) seasick. Could you 17.) build a bridge to Hawaii so I can drive 18.) over there with my car"? The genie 19.) laughed and said, 20.) "You´re out of your mind! Think of the logistics of that. How would the 21.) supports reach the bottom of the Pacific ocean. Think of how much 22.) concrete, how much 23.) steel! 24.) No way José!" "You can make another wish", the genie said. The man said Ok and tried to think of a really good wish. Finally he said, "I´ve been married and divorced four times. My wives always said that I don´t talk about my emotions and that I´m 25.) insensitive. So, I wish that I could understand women and know how they 26.) feel deep down in their heart and what they are thinking, especially when they give me the 27.) silent treatment. I want to know why they are crying, know what they really want when they answer 28.) "NOTHING". I 29.) would like to know how to make them really happy. The genie then 30.) asked him, "Do you 31.) want that bridge with two 32.) lanes or four"? Recordar la expresión: "You´re out of your mind" = Estás loco! Here´s a nice catchy = pegadiza song by Christina Aguilera called "Genie in a bottle"
Y también con "GOT TO" = TIENES: se dice "GOTTA"
(I'm a genie in a bottle) " " "
I'm a genie in a bottle baby " " "
Come, come, come on and let me out " " "
I can make your wish come true (Ooh) " " "
(you gotta rub me the right way) " " "
Come, come, come, on and let me out " " "
117.) EL USO DE "HOPE" Y "WISH"